Dolphin Water Taxi is the only USVI provider licensed to serve any BVI charter dock by boat. 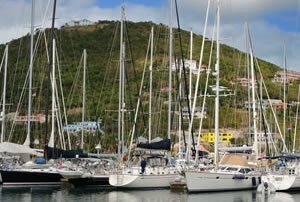 We offer quick private transfers from St. Thomas airport direct to all Tortola Charter docks. This saves our guests a considerable amount of time, hassle, and anxiety over trying to use the often unreliable public ferry system. And since we drop our guests directly on their charter dock they also save the trouble and expense of a cab ride after entering the BVI via ferry. Airline schedules often to match up well with the last ferry out to the BVI, which is another reason Dolphin Water Taxi is the preferred private transportation method to get from the bag claim at STT to any smaller destination in the BVI. Regular St. Thomas airport cabs won't depart without first filling up with arriving passengers, and then they make multiple stops usually resulting in unnecessary delays. With Dolphin, you will have your own private cab directly from STT to the port at Red Hook. At only $19pp, including complimentary beer and water onboard, Dolphin is a much better choice than regular airport cabs. After a long flight, collect your luggage and then simply leave everything else to us. Avoid the hassle, and get your vacation started off on the right foot. No standing outside in the hot sun in Downtown St. Thomas waiting in line for the public ferry. Dolphin's boat and crew will be ready as soon as our cab driver arrives with you in Red Hook. The crew will assist in transferring your luggage to the boat, chartered exclusively for your run to Tortola or beyond. Please be prepared upon arriving at the boat with your passport and the $60pp in cash to cover BVI international processing fees and crew fees readily available. As an added service to our guests and to save time going through customs, Dolphin uses an "Express-Clear" process entering the BVI with the boat manifest, customs, and immigrations forms all ready to go. In the event rain makes an attempt to hinder the first part of your journey, our boats are covered so guests and luggage stay dry enroute to West End, Tortola. It's a 30-min boat ride to the West End where your crew will "Express-Clear" you to the BVI! Dolphin's unique "Express-Clear" entry process means our guests (and luggage) can remain onboard and enjoy refreshments and music while the crew pays the fees and has the passports stamped. This normally only takes 10 to 15 minutes depending on the size of the group. Experienced travelers understand well the hassles of disembarking with 100-150 other arriving ferry passengers and standing in a long line for 30-45 minutes with luggage waiting to clear customs going into the BVI. Once cleared into the BVI our guest are brought directly to their charter dock, either by land or by sea. Once the BVI entry procedure has been complete and the fees paid most guests continue on to their Tortola-based destination (hotel or charter dock) by Dolphin's Tortola land transfer. Moving by land saves both total travel time to destination as well as money. For those guests who prefer moving beyond west end to their final destination by boat we can surely accommodate them with the added surcharge for the extra leg. This adds roughly $300 to the total trip cost, and will take an additional 10-20 mins of travel time depending on the port and the sea conditions. Those going on to Jost Van Dyke or Spanish Town in Virgin Gorda will clear customs at the house located there. Dolphin Water Taxi has the exclusive ability for after hours entry into the BVI (later than 6pm). If your arriving flight is late... no worries! Dolphin Water Taxi has a good relationship with our friends at the West End customs house who will come back in and re-open to clear our guests in. This way our arriving guests don't need to worry about a late flight ruining the beginning of their vacation plans. Applicable overtime fees apply. Please let us know in advance if you need to stop for groceries/provisioning after you land. Fares do not include a $60pp entry and $40pp exit fee which must be in cash (for wharfage, dockage, crew, international processing fees in both the USI and BVI). Fares do not include the 7.5% VI sales tax and processing fees, nor airport driver or crew gratuities. On the rare occasion of rough seas, moving guests Eastward beyond West End Tortola may be a challenge (at best a very uncomfortable ride). In such cases, guests are only charged for the West End destination fare. Cabs are available for transport from the customs house to their final destination. And in the event of even worse conditions and the issuance of Small Craft Advisories Dolphin Water Taxi boats remain in port. In this case, we can still perform the airport pickup and will also help facilitate the best ferry option to help complete your trip. Reconfirmation: Please make sure you call in 2 days prior to your scheduled trip to reconfirm and to get the Dolphin safari cab driver's contact cell to call as soon as you land in St. Thomas. There are no charges for trips cancelled due to weather or maintenance, or if we are unable to provide transport due to airline delays or cancelations. Once a reservation is completed with our online reservation form, and confirmed by providing payment information over the phone, there is a $200 fee to cancel the reservation. At 72 hours or less in advance of travel, all reservations are 100% non-refundable. Cancellations can ONLY be made by email at info@dolphinshuttle.com, as this creates a cancellation record. No-shows are 100% non-refundable and subject to the full value of the ticket price.